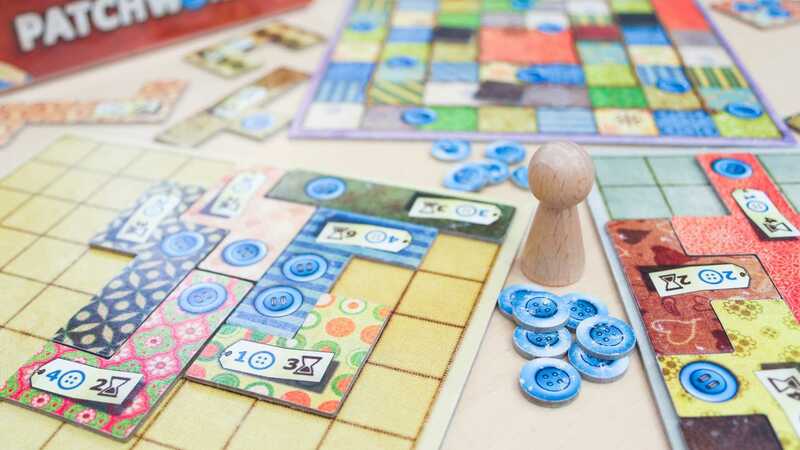 Patchwork is consistently a favorite of the Diversions team and customers. Its 2-player, Tetris-style game play is interesting and challenging. You are competing to build the best (highest scoring) quilt by collecting patches and sewing them onto your quilt. Selecting the best patch will fill up your quilt, but could take more time and cost more buttons (the game’s currency). This is a great game for those that enjoy visual/spatial reasoning. Players compete to create the most beautiful bouquet of blossoms in this 2-player game. You’ll draw cards from a deck that will allow you to take actions such as growing flowers or cutting them for your bouquet. In this push-your-luck game, each card you draw could help you or end your turn! This is a light game that takes 10-20 minutes to play. In this story-driven cooperative game, players are investigating a mystery and trying to solve it faster than Sherlock Holmes (good luck!). There are 10 scenarios in each game, with clues to help you along. Armed with a map of London, the phone directory, and some newspapers, you’ll interview the medical examiner, members of Scotland Yard, and even Moriarty’s informants for information to solve the mystery. This deduction game can take 2 to 3 hours to play and there is a competitive option if you prefer. Great for solo game play, 2 players, or groups. If you like Chess, Hive is a great alternative for faster game play. In this abstract strategy game, you will work to surround your opponent’s queen bee by using your insect tiles to move. Each insect has a special movement type – move 3 spaces around the outside, jump onto another tile, etc. It’s all about thinking ahead and planning your moves to outsmart your opponent! If you prefer heavier strategy games but want to play with just 2 players or keep the game under an hour, 7 Wonders Duel is a great option. Widely regarded as one of the best 2-player games available, this civilization building game offers a unique card-drafting mechanism by which you will collect resources such as wood, papyrus, and glass. Advance your civilization and build your Wonder of the World to gain points and come out on top! The original Codenames is one of the best party games to come out in recent years, and now there’s a 2-player version! Codenames Duet is played cooperatively, where players are trying to find their secret agents, represented by words, in the field. To reveal these secret agents, players give one-word clues that will connect agents together, but be careful to find them all before time runs out! Duet can be played with just 2 players, or in teams.